Today is brew day and as I toil in the kitchen a cold beer is required to keep the joints well lubricated for such a strenuous task. 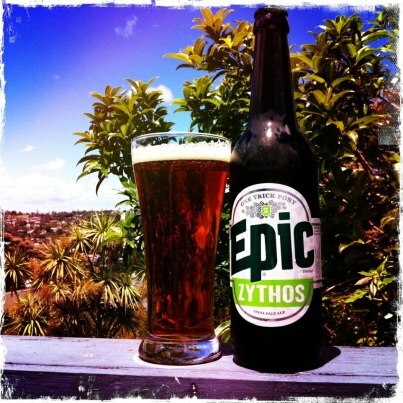 My beer of choice is Epic Zythos, because after yesterdays disastrous tasting of Mayhem I figured I need to give epic another chance. The wort is happily boiling away so I'm taking a moment to really savour the beer. I like the colour, its a lot lighter than the Mayhem, and the head is a little whiter to. Pours with a nice head and leave loads of lovely lacing and maintains its carbonation. I'm starting to feel like the mayhem was really let down by the lack of carbonation, it really didn't work too well as a flat beer. So I'm delighted with the staying power of the Zythos. Aroma is grapefruits and fresh crushed green pine needles. Sappy and sweet a nice light refreshing balanced aroma. The flavour of Zythos is something else, I want so say wintergreen, buts its not quite as a strong as that. Its light a pine flavoured malt candy. Very very tasty. Hints of grapefruit and citrus zest. Its got a resinous syrupy finish. Great mouthfeel with a comforting sensation of fully coating the tongue with flavour. Some lovely biscuity malt notes in there too. I much prefer Zythos to Mayhem, its moreish and better balanced. The carbonation is more on target and remains tasty to the last drop. I've got some in my freezer. I'm saving it for an all grain brew, which hopefully I'll have all the equipment for in a few weeks. (I'll be doing brew in a bag till I can fashion some kind of mash tun).